We are undoubtedly the world leaders in the sale of these engines, both new and overhauled. Over the last twenty years, we have sold more than five hundred engines to customers all over the world, indeed, even back to Russia. The last new engine from Russia was manufactured in 1993/4, although small amounts of engines have been made subsequently from unused, old-stock parts, but increasingly more and more overhauled parts have been incorporated, but our view is that there are no ‘new’ engines that have been made for the last four years, and, almost certainly for the future. Having said that small amounts of the large Russian historic production was distributed throughout Russia, and bought by people such as ourselves and then sold on, so there is still a certain number of unused, but old stock engines available. In terms of these engines, we would point out that the initial conservation was good for six years, and then extended for ten. Beyond this it is prudent to remove two cylinders; check the engine internally; reassemble and re-conserve. To read ‘An Introduction to the MP14P for flat-engined pilots’ by Fred Abramson. Under the Soviet system of aircraft design and production, Design Bureaux had the responsibility for designing aircraft/engines, which they would test until acceptance and then manufacturing would typically be given to a separate manufacturing plant. The principal product of the Vedeneyev Design Bureau has been the M14 family of engines, but these were originally designed as the AI-14 by the Ivchenko Design Bureau at Zaparozhye in the Ukraine . The AI-14 was originally produced in the late 1950s as a 260hp engine until the Soviet authorities made the decision to pass all piston-engine development to Ivan Vedeneyev, who had set up his own Design Bureau in Voronezh . In the meantime Ivchenko concentrated on a range of turbine engines, which they continue today. Vedeneyev’s first engine was the AI-14RF, which produced 300hp and this in turn led to the M14P, which was introduced in its Series I form in the early 1970s. This produced 360hp, and Series II came out in the early 1980s, still delivering 360hp, but with a variety of small internal improvements. Under the Soviet system (above) the actual manufacture of these piston engines was given to the Voronezh Mechanical Plant (VMP) a huge State controlled organisation, also in Voronezh , making a variety of aerospace products, including the Buran space-shuttle. After the collapse of the Soviet Union the lavish funding which Vedeneyev (also known as OKBM) and VMP previously received stopped, as did the requirement for large numbers of engines. This made little difference to VMP, for whom the production of piston aircraft engines was a relatively small part of their business, but created a significant problem for Vedeneyev, for whom the design of engines represented approximately half their business – the remainder being aerospace gearboxes. It is fair to say that we kept the business afloat during these difficult times with overhaul and spare parts business. There was continuing large scale production of engines in the early 90s with the last completed engine being manufactured by VMP in 1994. However they still had large numbers of major components and have continued to produce small numbers of engines since then from these pre-existing components and subassemblies. Extremely lightweight for their power. Very tough and reliable – the Russians operate generating sets in Siberian oil fields powered by M14Ps, which are expected to run for 20,000 hours before overhaul. Fully ‘inverted’ with the ability to run in any attitude. Dry-sumped, which ensures good lubrication at any attitude. Economical, despite their power – as little as 40 litres of fuel per hour at economical cruising. Currently the most powerful light aircraft engines available today – in versions up to 450hp. Beautifully made incorporating such items as roller-cam-followers and roller-rocker arms. Under Soviet agreements, Aerostar in Romania was designated as the production plant for Yak-52 aircraft and their sister company Aeromotors (now called Motorstar) was given licence to produce M14P engines for these aircraft. It is difficult to be sure, but it would seem to us that most Yak-52s were made for the Russian Air Force/DOSAAF in Russia and that the vast majority of these aircraft were fitted with Voronezh M14P engines from VMP, which were shipped to Romania for installation. However Yak-52s for other customers outside Russia usually have Romanian-built engines. The M14P family is certainly one of the World’s legendry aircraft engines, to a certain extent because of its exceptional record in world-class aerobatic competitions, but also because of its charismatic noise and high-power output for its weight. 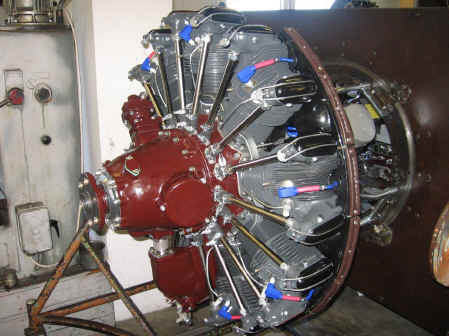 As the only radial engine in recent production, it also has a great deal of historical interest. The Russian National Team began asking for more power and the result was the M14PF in which the power is increased to 400hp by changing the supercharger gearbox so that the supercharger is turned at 10.5 times engine speed rather than 8.25. This therefore uses the same supercharger and other systems, but turns the supercharger impeller at an extremely high 30,000 rpm in order to produce the higher levels of boost necessary for greater power. The PF engine is now well-proven after some 20 years in service. In- service testing was done with the Russian National Team and the engine was principally used in competition aircraft, such as the Sukhoi, but now has much wider application in other Yaks. The PF is currently cleared up to 500 hours TBO, with the only proviso that the normal 100 hour checks are done at 50 hour intervals. We hope that this will be extended. We have now sold more than 100 ‘PF’ engines to customers all over the world and we are now fitting them to all Yaks types, both to achieve higher performance for aerobatic aircraft, but over 60% of the Yak-18Ts we sell are fitted with ‘PF’ engines to enhance take-off and climb performance as well as high altitude cruise. We have found PFs to be very reliable in practice, indeed on a statistical basis, somewhat more so than standard M14Ps. In the USA where engines can be operated ‘on condition’ several PFs are well over 1,500 hours with many over 500 hours. Most of the M14PF engines that we have sold have been from unused, but old-stock M14P engines, which we have bought and returned to Vedeneyev, who disassemble and convert these engines; reassemble; run on test beds and then passed to us and sold. At the end of 2004, it became clear that there were serious financial problems with the company. Because of this production was reduced to very small amounts, and the company was placed in a form of protective bankruptcy, similar to the US ‘Chapter 11’. However in 2006, Vedeneyev was purchased by FK System – a major Russian group with a wide variety of interests, including the control of Kamov Helicopters. They have injected considerable amounts of fresh capital; reorganised the business and in doing so changing it from a Soviet style organisation into a much more modern and competitive business. However in the recent financial crisis, FK Systems then had its own major financial problem and finally OKBM ceased production. The Russian Air Force issued a requirement for a high-performance two-seater training aircraft powered by a piston engine, to take over from the Yak-52. Sukhoi proposed the Su-49 – a tricycle retractable and extraction-system equipped version of the Su-29. Yakovlev proposed the Yak-54M, a similar modification to the Yak-54 aerobatic aircraft. In both cases the requirement was for a 450hp engine given the greater weight of the aircraft. The potential engine requirement was going to be large and clearly of interest to both Vedeneyev/OKMB and VMP. In 2002 we could see that there was a real market for an engine that changed a single seat Sukhoi from having a power-to-ratio of just under 1 to over 1, which could totally transform the aerobatics that were possible. We discussed this with Vedeneyev, and over a two year period, with our funding, they developed the M14R, essentially an M14P gearbox and crankcase, but with a totally re-designed supercharger and accessory case section. We had initially intended to use fuel injection, but for a variety of reasons 450hp was available with a carburettor, which meant that this was not necessary. Also it was felt that the engine would not be considered for use by the Russian Air Force if a non-Russian fuel-injection unit was used and at that stage there were no suitable Russian versions available. We have sold a number of M14R engines, although the first 3 engines suffered identical failures in the bushings of the supercharger drive shafts, which were turning at much higher speeds and under greater load. In all cases the engine continued to run and the aircraft landed safely. However this led to a re-design of the defective bearings, which were changed from bushings to roller bearings and after significant amounts of testing, the engine was put back in production, albeit slowly. We put as much pressure on Vedeneyev as possible, since we had considerable demand for these engines. The capability of the M14R engine is demonstrated by the fact that overall victor of the 2007 World Aerobatic Championships was Ramon Alonso of Spain flying his M14R equipped Sukhoi Su-31 aircraft – there can be no tougher test of an engine. As of 2011, we don’t think that more M14R will be provided, due to the failure of Vedeneyev. VMP began looking at ways of achieving the requirements for the Sukhoi Su-49 and for political reasons a bond had already been established between VMP and Sukhoi for this engine. A major problem was that the Su-49 has hydraulic rather than pneumatic systems and therefore the engine has to have a hydraulic pump as part of its ancillaries. Vedeneyev/OKBM had previously developed an engine called the M14B (360hp) for the Antonov An-14 ( a small utility aircraft), which had been totally re-designed to accommodate a hydraulic pump behind the supercharger. VMP decided that this engine should be the basis of their higher power engine, which they called the M9F, indicating that it is radically different from both the M14B and indeed the M14P. Inevitably, with two design teams working towards the same goal their results have been similar, although very different in detail. Indeed, we have bought/sold/overhauled a number of M14B engines and, although superficially very similar to M14P, it is interesting how many detailed differences there are. In 2003 Sukhoi decided to upgrade the Su-26M into the Su-26M3 and this aircraft was fitted with the M9F engine. This combination of engine and airframe has won almost every world and European Championship since then. We had an exclusive arrangement with VMP for the supply of M9F engines, and have done all we can to get regular supplies. However VMP received, in the middle of 2007, an order for 120 new M14P engines, principally for 60 new Yak-18T aircraft for the Russian Ministry of Transport. This has meant that their energies were totally directed to this big contract and we are not sure when more M9F engines might be available. However we have sold a number of them; one powered an American-owned Su-26M which won the Freestyle gold medal at the 2007 World Championships – certainly the most demanding element of the championships. The requirement for the Su-49 was 450hp and it is intended to achieve this with the M9F with fuel injection becoming the M9FS. The Russian system which has been developed is electronic, injecting fuel into each separate intake under high pressure. It also has a mechanical reversion, so if the electronic system fails, the engine will continue to run, albeit giving less power. I have seen the fuel injection system demonstrated showing an almost instantaneous reversion to mechanical injection, with the engine giving approximately 15% less power but clearly running perfectly well. Starting the engine is significantly simplified with no need for a primer and what is particularly impressive is the engine’s ability to go from idle to high power settings with none of the normal hesitation. It is intended that the fuel injection will be offered as a stand-alone alternative to the carburettor, giving enhanced power but also considerably improved economy. We now suspect that it will never be commercially produced. Of course both Vedeneyev/OKBM and VMP say that their high-powered engines are better than the other! Both have been very thoroughly developed and the real difference is that the M14R has a more radical impeller and diffuser design, as well as turning the impeller at higher speeds. Conversely the M9F is probably stronger in the supercharger area by virtue of larger bearings and reinforcement to take the hydraulic drive from the rear of the engine. BUT, more recently we have been unable to obtain any more of M9F or M14R engines and sadly have no reason to believe this will change. However, we have now developed a more powerful version of the M14PF using the superb Barrett Pistons with a higher compression ratio (8.2 to 1) which produces a reliable 440/445 horse power and is a much better alternative to M9F or M14R where so much emphasis was placed on high supercharger pressures, rather than on correcting the basic weakness of the piston design as has been done with these new engines of ours. With this procedure we sell the entire rear of the engine – that is everything behind the crank case including all of the ‘PF’ conversion kit built into the supercharger and all ancillary drives. This conversion is a straight ‘bolt-on’ conversion, although the engine needs to be removed from the aircraft and all accessories (magnetos, carburettor, oil pump etc) need to be removed. Finally the carburettor needs to be readjusted to cope with the different mixture requirements of the PF. We offer this conversion at Euro 4,500 on an exchange basis for the old unit. The new unit is totally zero-timed and comes with an EASA “Form 1”. The original M14P has output shaft with radial splines to mate with corresponding splines on the Russian V-530 propeller. Most PF engines have been intended for use with the German MTV-3 and MTV-9 propellers and so have been delivered with American SAE flanges. However, MT now makes propellers with both Russian and Western flanges, so effectively these are interchangeable. We can supply fully overhauled gearboxes incorporating either flange for Euro 3,000 on an exchange basis. For those interested we can also offer conversion of M14P to electric start rather than air start. Please see the separate description of our engine overhaul business. Our overhauled engines come from Aerometal in Hungary, who are the oldest established and largest overhauler of the AI-14 and M14 families of engines in the world. Aerometal will overhaul engines for our customers, and we also keep a stock of engines available for quick delivery to our customers. Typically we will always have in stock AI-14RA; M14P; M14PF (400hp) engines. In addition we have in stock gearboxes (with both Russian and SAE flanges); PF (400hp) supercharger assemblies; overhauled governors / magnetos / compressors. We have European exclusivity for the installation of the superb automotive plug conversions, and have EASA and CAA approval for this for all aircraft with these engines on both Sukhoi and Yak aircraft. A weakness of the Russian high tension ignition is that it uses relatively thin wires forced into a metal conduit and over time, the insulation tends to deteriorate allowing cross sparking between wires. Also, the Russian sparking plugs are very ‘old technology’ having been designed some 50 years ago. The Automotive plug conversion uses racing car-type silicone leads and the latest type of sparking plugs. These provide easier sparking; cooler running; slightly greater power and are the best conversion one can do on these engines for the money. Oil consumption is approximately 20% of standard pistons. There is significantly less “plug-fouling”. The engine has less piston friction so it gives a bit more power and runs cooler. These pistons have been tested at length by Barrett in the USA, both on test-beds and in very arduous use in air-show Sukhois and other aircraft. By virtue of our long relationship with Monty Barrett, we have European exclusivity for these pistons, and install them in engines that are being overhauled by Aerometal, our partner. They are available in either the standard compression or a higher compression version (8:1). The latter, when installed in the M14P, will typically give an increase of 20/25hp in itself. Barrett were initially reluctant to permit use of the PF supercharger with the high compression piston, but greater experience has meant that they now are happy to recommend this combination. So an engine thus equipped will typically give 430hp, together with all the various other advantages above. Unfortunately, as we say above, we cannot make these engines and certify them with a European “EASA” Form 1. However we are installing a lot of them for people for whom the intrinsic advantages are worthwhile, but of course these engines are principally sold outside Europe. Motorstar continue to make the M14P in small quantities, and were of course the manufacturer of a large number of M14Ps for the Yak-52s manufactured by Aerostar, their sister company next door. They have been working on the same problem, and have developed the SPC piston, which has now been in use for several years. This uses the same Russian “blank”, so does have the same disadvantages of the high rate of expansion. BUT it has much better technology piston -rings, and utilises only three piston rings rather than five. So this means that oil consumption is typically reduced by 35/40%; the engines run cooler and give slightly more power. Importantly, because the original blank is the same, we can manufacture engines using SPC pistons and give them EASA Form 1s, to be completely legal for aircraft in Europe. So, according to customer requirements we can fit either BPE or SPC pistons, and we are delighted to discuss particular requirements for any specific application. The standard ‘Lycoming’ SAE 6-bolt flange is at the limits of reliability with 400hp and unlimited level aerobatics. The Russian flange is safe in excess of 500hp since the bolts are larger and the radial splines provide better location for the hub on the flange. MTV-9 propellers are made with either Russian or Western flanges at the same price, as are the 250 or 260 blades. The original propeller blade profile was called the –27. We were looking for propellers for the M14R, and did not want to exceed 260cm for reasons of ground clearance on a normal Sukhoi and therefore asked MT if they could provide a propeller capable of transmitting more power but with no increase in diameter. The result has been the –29 wide chord blade, which will transmit 450hp at 260cm diameter. In practice we have established that the –29 blade gives significantly enhanced performance over the –27 blade even with 360-hp. Depending on the performance parameter, this ranges from +2% to +13%. Finally, in terms of choices, MT offers a standard and also a ‘large’ spinner for this propeller. (We have a separate information sheet on MTV propellers for Sukhoi and Yak aircraft). This entry was posted in Engine, Vedeneyev and tagged Engines on August 28, 2014 by admin.